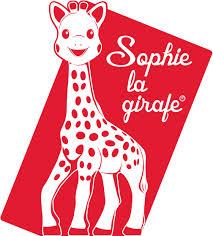 Sophie the Giraffe is baby's first toy and teether for babies, made ​​of 100% natural rubber and colored with food coloring.Sophie the Giraffe is a game suitable since birth, stimulates each of the five senses from the age of 3 months. Made from 100% natural rubber! Features several parts to chew on, and a range of textures (raised spots and ribbing) to massage and relieve baby's gums. The curved surface adapts to baby's mouth. Sold in recycled paper gift box. You baby can perfect his or her fine motor skills by manipulating the cubes and balls, catching them, piling them up, or throwing them. Set made of 2 balls and 2 cubes. 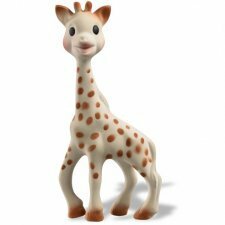 Sophie the Giraffe is baby's first toy and teether for babies, made ​​of 100% natural rubber and colored with food coloring. 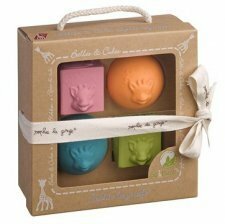 Sophie the Giraffe is a game suitable since birth, stimulates each of the five senses from the age of 3 months. Sophie is offered in a gift box of cardboard.